FC Barcelona face Atlético Madrid in the Copa del Rey semi-finals on Wednesday, and Diego Simeone’s side will not enter the tie in the highest of spirits after only being able to pick up a point during their latest league match. 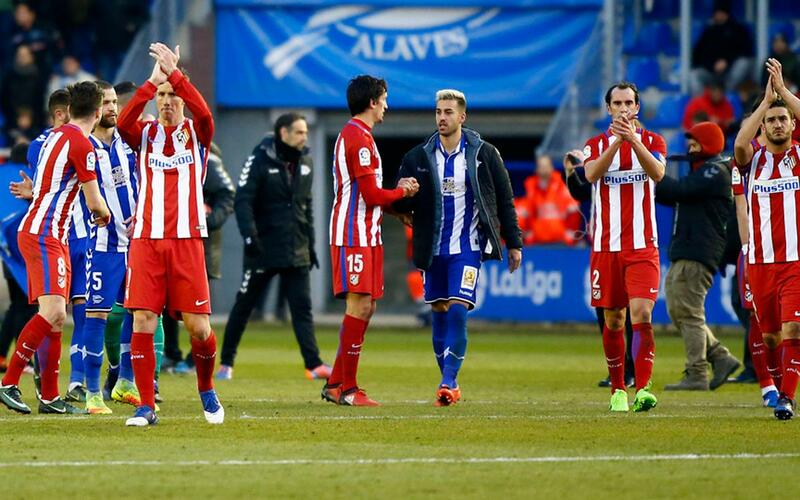 Alavés, who were also on the back of celebrating their passage to the final four of the cup, not only managed to hold Atlético to a goalless draw but were left feeling slightly disappointed at not gaining all three points. The hosts amassed 19 shots on goal and claimed 61 per cent of possession but nevertheless could not break down Atlético's tough defence. Simeone's men lie in fourth place, seven points behind Barça and Sevilla, and ten behind leaders Real Madrid. Sevilla, who played in between Barça’s draw at Real Betis and Real Madrid’s win against Real Sociedad had the chance to momentarily go top of the table with a victory at Espanyol. But the day started in the worst possible fashion for Jorge Sampaoli’s side and it ended in the same way for the Andalusians. Nicolás Pareja was given a straight red card after just two minutes and former Sevilla icon José Antonio Reyes scored the resulting penalty. The visitors did manage to pull level through Stevan Jovetic but goals from Marc Navarro and Gerard Moreno brought an end to their La Liga win streak of five, and allowed Barça to edge ahead of them into second on the head-to-head rule. Barça’s draw and Sevilla’s loss were Real Madrid’s gain as the league leaders extended their advantage at the top of the table to four points after a 3-0 win over Real Sociedad. Mateo Kovacic scored the breakthrough goal late in the first half, before Cristiano Ronaldo doubled their advantage on 51 minutes. Second half substitute Álvaro Morata rounded off a comfortable night for Madrid with a goal on 82 minutes, not long after he had a header ruled out for offside. The next league game for Barça sees them host a familiar foe in Athletic Club, whom they have already faced twice in the cup in 2017. The Basques hosted strugglers Sporting Gijón who have yet to win away from home this season. It was the visitors who took the lead from the spot through Čop in the first half, but goals from Iker Muniain and Aritz Aduriz, also via a penalty, helped Athletic to three points. Barça’s Champions League Round of 16 opponents PSG needed a win in their juicy encounter with Ligue 1 leaders Monaco to close the gap on the top to just one point. And it looked as though they were set for a precious three points with just nine minutes left when Julian Draxler was fouled in the box and Edinson Cavani converted the penalty. Yet, deep into injury time, Bernardo Silva scored the equaliser in what could prove a massive goal in the fate of the title.